Left bundle branch (LBB) block (LBBB) occurs when transmission of the cardiac electrical impulse is delayed or fails to be conducted along the rapidly conducting fibers of the main LBB or in both left anterior and posterior fascicles. Thus, the left ventricle slowly depolarizes by means of cell-to-cell conduction that spreads from the right ventricle to the left ventricle. 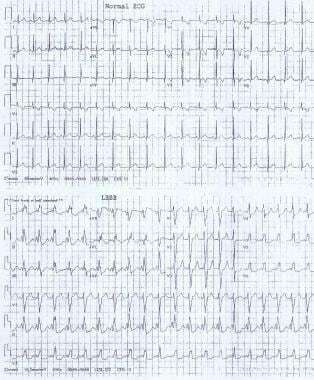 This results in the characteristic electrocardiographic (ECG) pattern shown in the image below. These electrocardiograms show a normal sinus rhythm and a sinus rhythm with a left bundle branch block. LBBB in children is associated with cardiovascular disease, surgery, or ablation within the left ventricle and is not observed in the general population. LBBB may occur in as many as 20% of individuals after aortic valve replacement. See Are You Missing Subtle MI Clues on ECGs? Test Your Skills, a Critical Images slideshow, to help identify a variety of electrocardiographic abnormalities. Knowledge of the anatomy and electrophysiology of the cardiac conduction system from the atrioventricular (AV) junction to the distal Purkinje fibers is essential to understanding the pathophysiology of left bundle branch (LBB) block (LBBB). The specialized conduction system of the heart is composed of cells that conduct electrical impulses faster than the surrounding myocardium. The conduction system can be divided into distinct anatomic segments, and each segment is described in sequence beginning at the AV junction and ending with the Purkinje fibers. 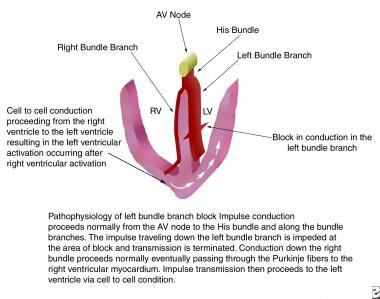 The AV junction has traditionally been divided into three regions as follows: transitional cell zone, AV node, and penetrating portion of the AV bundle (His bundle, common bundle). The transitional cell zone is where the right atrium merges with the compact AV node by means of discrete atrial pathways termed the slow and fast pathways. In the past, the slow and fast pathways were believed to be parallel. However, data from radiofrequency ablations of the AV nodal and AV reentrant tachycardias have demonstrated that the slow pathway is more closely associated with anterior-superior aspect of the os of the coronary sinus. Furthermore, the data show the fast pathway is located slightly superior and posterior to the AV node. The next segment is the AV node, which lies anterior and superior to the ostium of the coronary sinus, directly above the insertion of the septal leaflet of the tricuspid valve. This area is located at the apex of the triangle of Koch, which is formed by the tricuspid annulus, the tendon of Todaro, and the ostium of the coronary sinus. Blood supply to the AV node is derived from the AV nodal artery, which is a branch of the right coronary artery in 85%-90% of individuals and a branch of the left circumflex coronary artery in 10%-15% of individuals. At the apex of the triangle of Koch, the compact AV node becomes the penetrating bundle of His. It penetrates the central fibrous body at the attachment of the tendon of Todaro, runs between the membranous septum and the muscular septum, and bifurcates at the crest of the muscular ventricular septum. The His bundle is divided into three anatomic segments. The proximal, or nonpenetrating, segment lies distal to the AV node and proximal to the central fibrous body. The middle, or penetrating, segment penetrates the central fibrous body and runs posterior to the membranous septum. The distal, or branching, segment bifurcates at the crest of the muscular septum into the right and left bundle branches (see the image below). 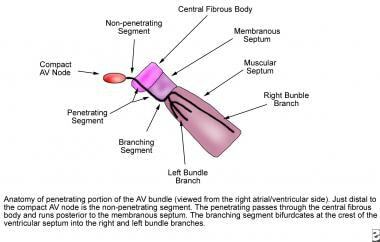 This image depicts the anatomy of the penetrating portion of the atrioventricular (AV) bundle. The right bundle branch, a direct continuation of the penetrating bundle, originates distal to the attachment of the septal leaflet of the tricuspid valve with the membranous septum and surfaces on the right ventricular septum just below the papillary muscle of the conus. It is unbranched and proceeds toward the apex of the right ventricle along the posterior margin of the septal band, courses through the moderator band to the base of the anterior papillary muscle, and proceeds to the right ventricular free wall. The LBB originates at the crest of the muscular ventricular septum just distal to the membranous septum. It arises in a fanlike fashion and descends inferiorly along the left ventricular septal surface beneath the noncoronary cusp of the aortic valve. The LBB usually branches into three major fascicles. The anterior fascicle is directed to the base of the anterolateral papillary muscle, the posterior fascicle is directed to the base of the posteromedial papillary muscle, and, in 60% of hearts, a central fascicle proceeds to the midseptal region. When no central fascicle is present, as in 40% of hearts, the midseptal region is supplied by radiations from the anterior fascicle or the anterior and posterior fascicles. At the terminal aspect of each bundle branch, Purkinje fibers are interlaced on the endocardial surface of both ventricles and tend to be concentrated at the tips of the papillary muscles. The heart is a two-step mechanical pump coordinated by precisely timed electrical impulses. For the pump to perform optimally, sequential depolarizations of the atria and then the ventricles allow atrial contraction to provide complete diastolic filling of the ventricles (AV synchrony). After the ventricles are filled, rapid activation of the ventricular myocardium permits a synchronized contraction to eject blood most effectively to the great vessels. In normal cardiac conduction, electrical excitation of the heart proceeds in a sequential manner from the atria to the ventricles and is demonstrated on the surface electrocardiogram (ECG) (see the image below). This image depicts the electrophysiologic events in normal cardiac conduction. AV = atrioventricular; ECG = electrocardiogram. The electrical impulse generated in the sinus node proceeds through the atria (reflected by the P wave on the ECG) to reach the AV node. As the impulse conducts through the AV node, conduction slows, allowing time for atrial contraction to occur before the ventricle is activated (PR segment). After the impulse passes through the compact AV node, it is rapidly conducted through the crux of the heart to the ventricles by means of the bundle of His (penetrating bundle) to the branching bundle, the bundle branches, the distal Purkinje fibers, and, finally, the ventricular myocardial cells (narrow QRS complex). Complete LBBB occurs when the electrical impulse is delayed or interrupted in either the main LBB or in both the anterior and posterior fascicles. Conduction down the right bundle branch normally proceeds, and the right ventricle depolarizes in the normal fashion. In complete LBBB, conduction from the right ventricle passes first to the interventricular septum, then to the anterior and posterior portions of the left ventricle, and finally to the left lateral free wall. 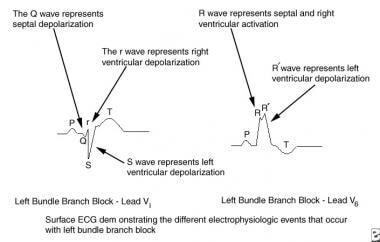 Delayed left ventricular depolarization accounts for the ECG findings in left bundle branch block (see the images below). This image depicts the pathophysiology of left bundle branch block. AV = atrioventricular; LV = left ventricle; RV = right ventricle. This image depicts the electrophysiologic events of left bundle branch block. ECG = electrocardiogram. Incomplete LBBB occurs in two forms, each called hemiblock. In left anterior hemiblock (LAH), transmission of the electrical impulse proceeds normally along the main LBB and the posterior fascicle, but it is blocked or delayed in the anterior fascicle. This blockage results in delayed activation of the anterior portion of the left ventricle. In LAH, the duration of the QRS complex may be of normal or only slightly prolonged duration because of normal rapid conduction down the right and left main bundle and the left posterior fascicle. In addition, the QRS complex is directed superiorly in the frontal plane. This is called left axis deviation, although the term superior axis deviation most accurately describes the finding. Furthermore, QRS axis is normally to the left; therefore, the term left axis deviation makes little semantic sense. With left posterior hemiblock, transmission of the electrical impulse proceeds normally along the main LBB and the anterior fascicle, but it is blocked in the posterior fascicle. This blockage results in delayed activation of the posterior left ventricle. The QRS complex is again of normal or only slightly prolonged duration and inscribes a rightward axis in the frontal plane. Left posterior hemiblock is rarely observed in children, and diagnosis is difficult because of the common association of right axis deviation in children with congenital heart disease and right ventricular hypertrophy. LBBB is associated with anatomic malformations and abnormalities of the conduction system (eg, as is observed in Lenegre disease). LBBB has been observed after surgery in the left ventricular outflow tract, septal myectomy, alcohol septal ablation, replacement of the aortic valve, radiofrequency ablation, and transcatheter closure of perimembranous ventricular septal defects. The LBBB pattern, or rather, left ventricular conduction delay, also occurs in patients with Wolff-Parkinson-White Syndrome in whom the abnormal conduction pathway enters the right ventricle. Some patients may demonstrate a LBBB pattern during supraventricular tachycardia (ie, rate-dependent bundle branch block). LAH has been associated with coronary artery disease, left ventricular hypertrophy, cardiomyopathy, tetralogy of Fallot repair, ventricular septal defect repair, septal myectomy, subvalvar aortic resection, and an anomalous origin of the left coronary artery from the pulmonary artery. LAH may be present in patients with autosomal dominant bundle branch disease and has been associated with lentiginosis. Among congenital heart defects, LAH is characteristic of endocardial cushion defects, such as ostium primum atrial septal defect complex and complete AV canal, an abnormality frequently seen in patients with Down syndrome. LAH occurs in endocardial cushion defects because of congenital absence or hypoplasia of the left anterior division. LAH has also been described in Noonan syndrome. Patients with endocardial cushion defects (ostium primum atrial septal defect, complete AV canal), tricuspid atresia, double-outlet right ventricle, and certain forms of a functional single ventricle have LAH that may reflect absent, hypoplastic, or abnormally coursing left bundle fascicles rather than an anterior hemiblock per se. Left posterior hemiblock is observed after congenital heart surgery and in patients with congenital aortic stenosis, endocarditis, or diphtheritic myocarditis. Progression to complete heart block or sudden death is rare, and the prognosis depends on associated systemic or cardiovascular disease more than the left bundle branch block (LBBB) itself. Biventricular pacing may improve clinically significant and progressive morbidity associated with concomitant congestive heart failure. Patients with LBBB, left axis deviation, and first-degree heart block or LBBB associated with near-syncope or syncope require close follow-up and/or electrophysiologic study. In adults, LBBB can disturb coronary perfusion of the left anterior descending coronary artery by shortening the duration of diastolic flow. As noted, if LBBB progresses to complete heart block, the patient may have syncope or suddenly die. Flowers NC. Left bundle branch block: a continuously evolving concept. J Am Coll Cardiol. 1987 Mar. 9(3):684-97. [Medline]. Christoffels VM, Moorman AF. Development of the cardiac conduction system: why are some regions of the heart more arrhythmogenic than others?. Circ Arrhythm Electrophysiol. 2009 Apr. 2(2):195-207. [Medline]. Massing GK, James TN. Anatomical configuration of the His bundle and bundle branches in the human heart. Circulation. 1976 Apr. 53(4):609-21. [Medline]. Waller BF, Gering LE, Branyas NA, Slack JD. Anatomy, histology, and pathology of the cardiac conduction system: Part II. Clin Cardiol. 1993 Apr. 16(4):347-52. [Medline]. Francia P, Balla C, Paneni F, Volpe M. Left bundle-branch block--pathophysiology, prognosis, and clinical management. Clin Cardiol. 2007 Mar. 30(3):110-5. [Medline]. Chien SJ, Liang CD, Lin IC, Lin YJ, Huang CF. Myocarditis complicated by complete atrioventricular block: nine years' experience in a medical center. Pediatr Neonatol. 2008 Dec. 49(6):218-22. [Medline]. Blanc JJ, Fatemi M, Bertault V, et al. Evaluation of left bundle branch block as a reversible cause of non-ischaemic dilated cardiomyopathy with severe heart failure. A new concept of left ventricular dyssynchrony-induced cardiomyopathy. Europace. 2005 Nov. 7(6):604-10. [Medline]. Diogenes MS, Succi RC, Machado DM, et al. Cardiac longitudinal study of children perinatally exposed to human immunodeficiency virus type 1 [in Portuguese]. Arq Bras Cardiol. 2005 Oct. 85(4):233-40. [Medline]. Kasmani R, Okoli K, Mohan G, Casey K, Ledrick D. Transient left bundle branch block: an unusual electrocardiogram in acute pulmonary embolism. Am J Med Sci. 2009 May. 337(5):381-2. [Medline]. Yokoyama R, Kinoshita K, Hata Y, et al. A mutant HCN4 channel in a family with bradycardia, left bundle branch block, and left ventricular noncompaction. Heart Vessels. 2018 Jan 18. [Medline]. Kim JH, Baggish AL. Electrocardiographic right and left bundle branch block patterns in athletes: prevalence, pathology, and clinical significance. J Electrocardiol. 2015 May-Jun. 48 (3):380-4. [Medline]. Jackson T, Sohal M, Chen Z, et al. A U-shaped type II contraction pattern in patients with strict left bundle branch block predicts super-response to cardiac resynchronization therapy. Heart Rhythm. 2014 Oct. 11 (10):1790-7. [Medline]. Calabro MP, Cerrito M, Luzza F, Oreto G. Alternating right and left bundle branch block aberration during atrial tachycardia. J Electrocardiol. 2009 Nov-Dec. 42(6):633-5. [Medline]. Rivard L, Schram G, Asgar A, et al. Electrocardiographic and electrophysiological predictors of atrioventricular block after transcatheter aortic valve replacement. Heart Rhythm. 2015 Feb. 12(2):321-9. [Medline]. [Guideline] Shen WK, Sheldon RS, Benditt DG, et al. 2017 ACC/AHA/HRS Guideline for the evaluation and management of patients with syncope: executive summary: a report of the American College of Cardiology/American Heart Association Task Force on Clinical Practice Guidelines and the Heart Rhythm Society. J Am Coll Cardiol. 2017 Aug 1. 70 (5):620-63. [Medline]. [Guideline] Yancy CW, Jessup M, Bozkurt B, et al, for the American College of Cardiology Foundation., American Heart Association Task Force on Practice Guidelines. 2013 ACCF/AHA guideline for the management of heart failure: a report of the American College of Cardiology Foundation/American Heart Association Task Force on Practice Guidelines. J Am Coll Cardiol. 2013 Oct 15. 62 (16):e147-239. [Medline]. [Guideline] Yancy CW, Jessup M, Bozkurt B, et al. 2016 ACC/AHA/HFSA focused update on new pharmacological therapy for heart failure: an update of the 2013 ACCF/AHA guideline for the management of heart failure: a report of the American College of Cardiology/American Heart Association Task Force on Clinical Practice Guidelines and the Heart Failure Society of America. J Am Coll Cardiol. 2016 Sep 27. 68 (13):1476-88. [Medline]. [Guideline] Yancy CW, Jessup M, Bozkurt B, et al. 2017 ACC/AHA/HFSA focused update of the 2013 ACCF/AHA guideline for the management of heart failure: a report of the American College of Cardiology/American Heart Association Task Force on Clinical Practice Guidelines and the Heart Failure Society of America. J Am Coll Cardiol. 2017 Aug 8. 70 (6):776-803. [Medline]. [Guideline] Epstein AE, DiMarco JP, Ellenbogen KA, et al. ACC/AHA/HRS 2008 Guidelines for Device-Based Therapy of Cardiac Rhythm Abnormalities: a report of the American College of Cardiology/American Heart Association Task Force on Practice Guidelines (Writing Committee to Revise the ACC/AHA/NASPE 2002 Guideline Update for Implantation of Cardiac Pacemakers and Antiarrhythmia Devices) developed in collaboration with the American Association for Thoracic Surgery and Society of Thoracic Surgeons. J Am Coll Cardiol. 2008 May 27. 51(21):e1-62. [Medline]. [Guideline] Epstein AE, DiMarco JP, Ellenbogen KA, et al, for the American College of Cardiology Foundation, American Heart Association Task Force on Practice Guidelines, et al. 2012 ACCF/AHA/HRS focused update incorporated into the ACCF/AHA/HRS 2008 guidelines for device-based therapy of cardiac rhythm abnormalities: a report of the American College of Cardiology Foundation/American Heart Association Task Force on Practice Guidelines and the Heart Rhythm Society. J Am Coll Cardiol. 2013 Jan 22. 61 (3):e6-75. [Medline]. Shen X, Aronow WS, Holmberg MJ, et al. Cardiac resynchronization therapy in patients with intrinsic and right ventricular pacing-induced left bundle branch block pattern. Am J Ther. 2009 Nov-Dec. 16(6):e44-50. [Medline]. Delnoy PP, Ottervanger JP, Luttikhuis HO, et al. Long-term clinical response of cardiac resynchronization after chronic right ventricular pacing. Am J Cardiol. 2009 Jul 1. 104(1):116-21. [Medline]. Becker AE, Anderson RH. Morphology of the human atrioventricular junctional area. Wellens JHH, Lie KI, Janse MJ, eds. The Conduction System of the Heart. Philadelphia, PA: Lea & Febiger; 1976. 263-71. Castellanos A, Kessler KM, Myerburg RJ. The resting electrocardiogram. Schlant RC, Alexander RW, eds. Hurst's The Heart. 8th ed. New York, NY: McGraw-Hill Medical; 1994. 330-7. Colvin EV. Cardiac embryology. Garson A, Bricker JT, Fisher DJ, Neish SR, eds. The Science and Practice of Pediatric Cardiology. 2nd ed. Baltimore, MD: Williams & Wilkins; 1998. 91-123. Demoulin JC, Kulbertus HE. Histopathologic correlates of left posterior fascicular block. Am J Cardiol. 1979 Nov. 44(6):1083-8. [Medline]. 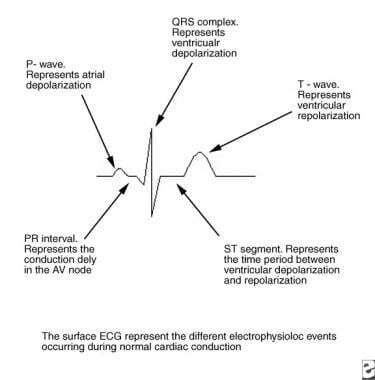 Dubin D. Rapid Interpretation of EKGs. 3rd ed. Tampa, FL: Cover; 1984. 137-42. Garson A. Interventricular conduction disturbances. The Electrocardiogram in Infants and Children: A Systematic Approach. Philadelphia, PA: Lea & Febiger; 1983. 119-42. Garson A. Electrocardiography. Garson A, Bricker JT, Fisher DJ, Neish SR, eds. The Science and Practice of Pediatric Cardiology. 2nd ed. Philadelphia, Pa: Lippincott Williams & Wilkins; 1997. 736. Gillette PC, Garson A. Pediatric Arrhythmias: Electrophysiology and Pacing. Philadelphia, PA: WB Saunders; 1990. 317-27. Hamby RI, Weissman RH, Prakash MN, Hoffman I. Left bundle branch block: a predictor of poor left ventricular function in coronary artery disease. Am Heart J. 1983 Sep. 106(3):471-7. [Medline]. Husson GS, Blackman MS, Rogers MC, et al. Familial congenital bundle branch system disease. Am J Cardiol. 1973 Sep 7. 32(3):365-9. [Medline]. James TN. The connecting pathways between the sinus node and A-V node and between the right and the left atrium in the human heart. Am Heart J. 1963 Oct. 66:498-508. [Medline]. Keefe DL, Griffin JC, Harrison DC, Stinson EB. Atrioventricular conduction abnormalities in patients undergoing isolated aortic or mitral valve replacement. Pacing Clin Electrophysiol. 1985 May. 8(3 Pt 1):393-8. [Medline]. Krikler DM, Lefevre D. Intermittent left bundle-branch block without obvious heart-disease. Lancet. 1970 Mar 7. 1(7645):498-500. [Medline]. Leibman J, Plonsey R, Gillette PC. Interruption of conduction abnormalities. Pediatric Electrocardiography. Philadelphia, PA: Lippincott Williams & Wilkins; 1985. 172-91. Li TC, Hu DY, Bian H, et al. Effects of transcatheter closure of perimembranous ventricular septal defects: intermediate and long-term follow-up of 68 cases [in Chinese]. Zhonghua Yi Xue Za Zhi. 2005 Oct 26. 85(40):2846-9. [Medline]. Lopes VM, Miguel JM, dos Reis DD, et al. Left-posterior hemiblock. Clinical and vectorcardiographic study of twenty cases. J Electrocardiol. 1974. 7(3):197-214. [Medline]. Milliken JA. Isolated and complicated left anterior fascicular block: a review of suggested electrocardiographic criteria. J Electrocardiol. 1983 Apr. 16(2):199-211. [Medline]. Perloff JK, Roberts NK, Cabeen WR Jr. Left axis deviation: a reassessment. Circulation. 1979 Jul. 60(1):12-21. [Medline]. Pickhoff AS. Electrophysiology: development and function of the cardiac conduction system. Allen HD, Gutgesell HP, Clark EB, Driscoll DJ, eds. Heart Disease in Infants, Children, and Adolescents: Including the Fetus and Young Adult. 6th ed. Philadelphia, PA: Lippincott Williams & Wilkins; 2000. 414-24. Rossi L. Histopathology of Cardiac Arrhythmias. 2nd ed. Philadelphia, PA: Lea & Febiger; 1979. 1-75. Schaal SF, Seidensticker J, Goodman R, Wooley CF. Familial right bundle-branch block, left axis deviation, complete heart block, and early death. A heritable disorder of cardiac conduction. Ann Intern Med. 1973 Jul. 79(1):63-6. [Medline]. Sharratt GP, Virmani S. Left-axis deviation in otherwise healthy children. Pediatr Cardiol. 1985. 6(1):7-9. [Medline]. Shaver JA, Salerni R. Auscultation of the heart. Schlant RC, Alexander RW, eds. Hurst's The Heart. 8th ed. New York, NY: McGraw Hill Medical; 1994. 269. Silka MJ. Bundle branch block. Garson A, Bricker JT, Fisher DJ, Neish SR, eds. The Science and Practice of Pediatric Cardiology. Philadelphia, PA: Lippincott, Williams & Wilkins; 1997. 2033-45. Stollberger C, Winkler-Dworak M, Blazek G, et al. Age-dependency of cardiac and neuromuscular findings in left ventricular noncompaction. Int J Cardiol. 2006 Jul 28. 111(1):131-5. [Medline]. Sun XJ, Gao W, Zhou AQ, et al. Risk factors for arrhythmia early after transcatheter closure of perimembranous ventricular septal defects [in Chinese]. Zhonghua Er Ke Za Zhi. 2005 Oct. 43(10):767-71. [Medline]. Tawara S. Das Reizleitungssystem des Saugetierkerzens. Jena: Gustav Fisher; 1906. Van Praagh R, Van Praagh S. Morphologic anatomy. In: Fyler, DC, ed. Nadas' Pediatric Cardiology. Philadelphia, PA: Hanley & Belfus; 1992. 23. [Guideline] Wagner GS, Macfarlane P, Wellens H, et al. AHA/ACCF/HRS recommendations for the standardization and interpretation of the electrocardiogram: part VI: acute ischemia/infarction: a scientific statement from the American Heart Association Electrocardiography and Arrhythmias Committee, Council on Clinical Cardiology; the American College of Cardiology Foundation; and the Heart Rhythm Society. Endorsed by the International Society for Computerized Electrocardiology. J Am Coll Cardiol. 2009 Mar 17. 53(11):1003-11. [Medline]. Waller BF, Schlant RC. Anatomy of the heart. Schlant RC, Alexander RW, eds. Hurst's The Heart. 8th ed. New York, NY: McGraw-Hill Medical; 1994. 99-102. Walsh, EP. Electrocardiography and introduction to electrophysiologic techniques. Fyler, DC, ed. Nadas' Pediatric Cardiology. Philadelphia, PA: Hanley & Belfus; 1992. 134. Youn HJ, Park CS, Cho EJ, et al. Left bundle branch block disturbs left anterior descending coronary artery flow: study using transthoracic Doppler echocardiography. J Am Soc Echocardiogr. 2005 Oct. 18(10):1093-8. [Medline]. Wei L, Lu YY, Hua YM, et al. [Changes in electrocardiographic parameters in children with complete left bundle branch block early after transcatheter closure of ventricular septal defect] [Chinese]. Zhongguo Dang Dai Er Ke Za Zhi. 2017 Jun. 19 (6):663-7. [Medline]. The authors and editors of Medscape Drugs & Diseases gratefully acknowledge the contributions of previous author Christopher Mart, MD, to the development and writing of this article.